At a mock funeral for the death of painting, Charles Mahaffee set up a few amplifiers and drowned the audience in a crushing drone. Had it been a real funeral, the monotone dirge would have been the perfect accompaniment to oblivion’s threshold. 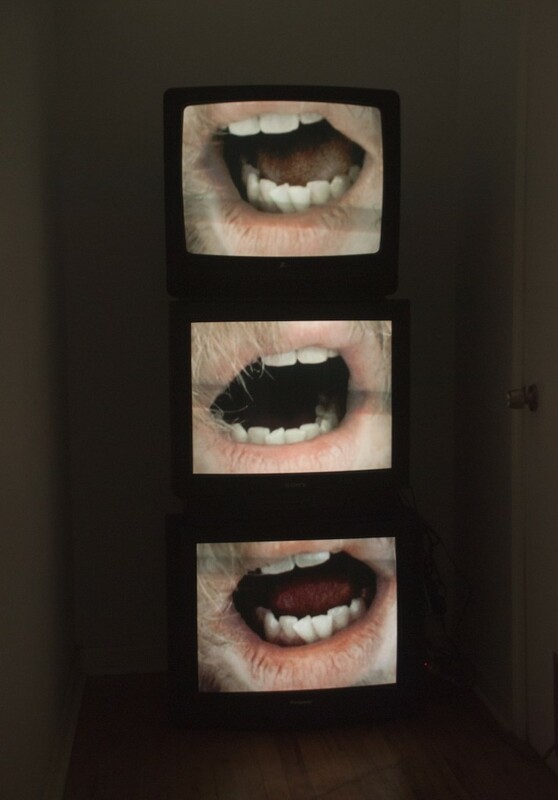 The drone makes another forceful appearance in Mahaffee’s solo exhibition, titled “Chorus.” A stacked-television totem sets the mood for the show and greets gallery visitors with open-mouth shouting. Here, the focus is on the artist’s mouth hole as it emits a single, sustained tone that is somewhere between a wail and a meditation, and ultimately uncomfortable to hear. The fleshy air of sound and words is further explored in several wall-sized charcoal drawings. These depict, again, the mouth holes, and repeated words (such as “damn” and “dumb”), in an obsessive, chalkboard style, like a self-punishment. The drawings, akin to the sound pieces, suggest an action without end, and drawn in thick black layers of charcoal, they are stark, serious, and overpowering. The sum pieces in “Chorus” work over viewers in the same way that sacred silence does, opening a portal to a void. Ultimately, Mahaffee’s drone silences the chaos of the mind by obliterating it. Get out of your body and bathe in the unrest, the works seem to say; release your self.